Chow and Chatter: Is Your Teen Getting Enough Milk? It was found that in a study with 1500 participants conducted by the University of Minnesota that teens in high school decreased their calcium intake. In fact more than 1/2 of boys and 2/3 of girls were not getting the recommended daily amount. Its crucial to get enough calcium and vitamin D at this stage in life to ensure peak bone mass is reached. 1300mg/day is needed for high school students and 1000mg for young adults. Encourage a glass of milk with dinner, a refreshing fruit smoothie or calcium fortified orange juice to help get this vital mineral. Hope your lil one is doing fine now. Uh-oh! Hope she's feeling better. Oh poor girl.. Hope she gets well..! 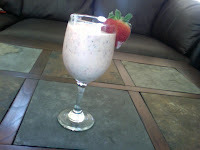 Even i hate milk, but smoothies... love them..! I like milk. Notice I didn't say love. hehe...Smoothies always hit the spot for me. I don't drink milk, but I love yogurt and cheese. I'm actually a bit suspicious of the milk in the grocery stores. Oh man...I hope your little girl feels better soon! Kristin you are on the front line of this ! agrrrrrrr....all my typing are just gone! sorry for the little sweety of yours, hope she gets well soon. Good advice about milk and calcium. My older daughter stopped drinking milk when she was 15 months old, and I pushed her to eat at least a lot of cheese and yogurt. And then suddenly, when the little one was born, and she was 3 by the time, she started drinking it again. I remember how my mom used to convince us that we needed to dring a big glass of milk in the morning so we could run faster. And I really believed that. Scary about teens and calcium. In fact, it's scary about teens and health in general!! Hope your little sweetie is feeling better. Smoothies are always a good thing. I give the boys wonder dairy in yogurt, cheese, and milk; however, I stopped drinking it years ago and live on milk alternatives: soy, almond, etc. I'm trying to vary it for them so they get enough even when they don't feel like knocking back a glass. I hope your little one is feeling better...it's so pitiful when they're sick!!! I hate to admit this, but I despise milk, however, I really should make a conscientious effort to drink things like smoothies! Dajana: your mums advice is so cool! Gina: thanks yeah teens diets need some TLC! I hope she's feeling better now...poor little thing! And thank goodness my little one's love dairy! !